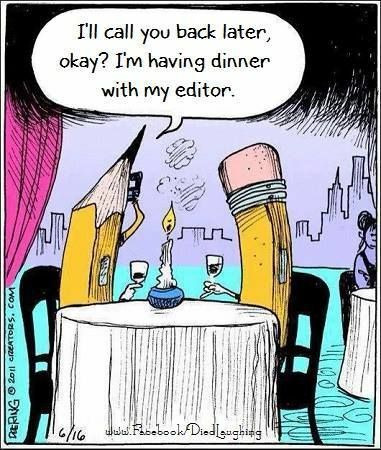 Or maybe the editor could be a red pen with a seemingly unlimited supply of ink. I gazed through the Deathhorn’s cockpit glass. A luxury Saddat liner floated helplessly in the black space below us. With the new hijacker model, we’d been able to stop the ship without causing damage to anything, a good thing considering this was civilian ship. Klate stood next to me, behind the pilot’s chair where Amellia sat. “Move in for boarding,” he ordered. Amellia expertly piloted the Deathhorn closer to the other ship, her movements smooth, something few Humans could pull off with such dexterity. “Krys, contact the ship,” Klate said. I flipped on the short range communicator. “This is the Deathhorn hailing liner 501,” I said. Crews tended to surrender easier if they were contacted by a Human, not our huge Elba captain. The Deathhorn shuddered as it touched the other ship. The two ships went belly to belly so we could go into our cargo hold and leap through the hatch into the other ship’s hold. “Time to board.” Klate ducked out of the cockpit and headed down the hallway toward the hold. I followed after him and flexed my cybernetic hand, extending claws from my three fingers and thumb. Even after having the cybernetic hand for a year, it still felt foreign and I couldn’t accurately shoot a pistol with it. It was crazy strong though, so it came in handy at close range. I touched the stunner pistol at my hip with my real hand, then checked my belt for spare ammunition. Klate’s crew fell in with him. Tenned hung back a bit. Being second in command, it wasn’t a good idea for him to be too close to Klate. If Klate got injured, Tenned had to be far enough away he wouldn’t get hit and be unable to take command. Doc stayed with Tenned. Even though Doc was only three feet tall, he could have fought with the best of us, but we couldn’t risk out medic getting hurt. We made it to the cargo hold, where stacks of flexsteel had been strapped to the walls. “Think they’ll have many mercenaries?” I asked Klate. We donned masks to protect us from any gas grenades. The ships’ hatches whooshed open. A grenade flew through from the other side and got caught in the neutral gravity between the hatches. It exploded with a deafening bang and a flash of electric gel, which missed all of us and went to spark on the ship’s floor. Whoever was on the other side of the hatch had no experience with boarding a ship. Anyone who had fought knew that to get a grenade through the neutral gravity between ships, it had to be thrown hard, not dropped through the hatch. Klate threw a paralysis gas grenade through the hatch, but unlike whoever was on the other side, he threw the grenade hard, sending it all the way into the other ship. We waited thirty seconds, then Klate dove headfirst through the hatch. I followed him, the rest of the crew on my heels. I felt the gravity reverse as I came up through the other ship’s floor. I landed on my hands and knees, then sprang up and scanned the cargo hold. The yellowish gas from the grenade screened our entrance. I ran for the nearest cover visible, a load of crates. Klate dove behind another stack of crates as the rest of the crew sprang through the hatch. He fired into the gas. Someone cried out as Klate’s dart hit them. I peered through the thinning gas at the hatch leading out of the hold and to the rest of the ship. Someone had closed it, probably hoping to buy more time. Two Skallan lay on the floor, one wearing a mask, while the other one hadn’t got a mask on in time to avoid inhaling the gas. Klate left the cover of his crates and knelt by them. I went to him. Both of the Skallan breathed fast, panicked. Breathing was one of the few things someone under the influence of paralysis could control. Frightened ones at that, judging by their panicked breathing. The one without the mask looked at me, her eyes wide. Most likely, the masked one had exposed himself in an attempt to get his friend, or perhaps wife, to safety. “We won’t hurt you,” I said. They’d tried to fight, even though they had to know their odds were bad. Normally, civilians simply surrendered, but this ship seemed full of surprises. Klate waved the crew back, then grabbed another stunner grenade, this one meant to throw the electric gel around and shock anyone who came in contact with it. In the first paragraph, the sentence that starts ‘With the new hijacker model…’ was confusing since you’d just been talking about the liner vessel. Took me a sec to figure out which ship you were talking about. As an expert on wordiness, I’ve learned that your above sentence can be more concise. Klate and I stood behind the pilot’s chair. “Move in boarding, Amelia,” he ordered. Could be two sentences or made shorter. The grenade information could be whittled down into one paragraph instead of two. Same with the Skallan info. Over all, good story and interesting characters. I want to know now why the civilians were fighting. What’s on board that made them risk their life? Can’t wait to find out. Thank you! Since it’ll be a while until it’s published and this question is revealed within the chapter, I’ll tell you. This civilian crew is smuggling weaponry, which is why Klate’s pirates boarded. The reason the civilians didn’t surrender is because there’s another pirate in the region who is slaughtering crews, rather than showing mercy. Not only is this bad news for the ships in the region, it’s bad news for Klate because it means ships won’t surrender easily, making his job more dangerous. As usual, you have a lot of good technique, and you are developing an interesting story. You sometimes include narrative that isn’t necessary, which slows the action. I offered simplifications in several places. Also, sometimes your verbs lacked descriptiveness, like “went” and “headed.” Strive for more visual verbs. If you have any questions about my edits or comments, let me know. First, let me say that I really enjoyed the premise of this story. It feels like it’s going to be a great tale with some really likable characters. However, I do feel a little detached from the action going on, due to the lengthiness of the asides. While this is certainly better than info-dumping, it feels as though we stop for an aside every other paragraph or so, eliminating some of the tension that could otherwise be built up in this scene. “Amelia expertly piloted…” The way this sentence is arranged, it sounds as though the smooth movements are what few humans can do. What about the maneuver makes it surprising for a human? “Surrender easier” sticks out a little bit to me. Can you strengthen your character’s inner voice and tone through a different choice of vocabulary? You make a great use of action beats and dialogue tags in the next couple of paragraphs. The dialogue has a nice, natural flow to it, and the beats paint in a bit more of the picture without feeling stifling. After the narrator’s ultimatum, the opposing captain doesn’t respond. How do they decide that they’re left with no choice but to fight? Is the communicator still on? Is it a visual communicator? If so, can we get a description of the opposing captain and/or crew? If not, what about the Elba captain would be frightening, other than his size, that would explain the narrator’s job? Deathhorn (awesome ship name, by the way), should be italicized in this next paragraph. I really like the use of “shuddered” here. Are there other strong verbs you could use for the positioning to replace “went” and “could go”? Since this is going to be performed in the next few paragraphs, is the description of what will happen necessary? Or can you convey something about the narrator (emotional state, experience, etc.) alongside this description that justifies its placement? I like how we’re naturally introduced to the narrator’s cybernetic hand. However, this paragraph takes me out of the story a bit. Rather than just stating its drawbacks and strengths, can you convey emotion about the situation/characterize the narrator more with the description? Does the lack of accuracy bring trepidation, or cool concern and analysis about the upcoming raid? Is the narrator not part of Klate’s crew? Why does the narrator not choose to use “we” when referring to the crew? “Tenned had to be far..” I had to read this sentence a couple of times to be able to understand it, though that may just be me. Yet, this little tidbit does reveal the thoughtfulness of the crew, which I like. They seem like a really veteran team. “We donned masks…” What other preparations are going on? Can you convey a sense of urgency, excitement, grim determination, etc. through a sentence like this? This would be a great moment to build a little suspense. This next paragraph feels a little long to me. It takes me out of the tense action for another aside. Can you combine it with Klate’s action in the next sentence? Or perhaps use conversation to show the narrator’s opinion about the inexperienced person on the other side of the hatch. Does the narrator feel pity? Disgust? If not the narrator, then how about the other crew members? Do any of them feel the need to make snide remarks/do some trash talking to get them psyched up for the engagement? Does the narrator’s cybernetic hand play into his/her boarding strategy at all, especially landing on hands and knees? “Frightened ones at…” Since you established the panicked breathing already, is this necessary? The slower pace of this paragraph takes me out of the action and intensity again. The narrator’s external and internal dialogue here provides a great opportunity for more characterization. I’m already starting to like the narrator–can you give me more reasons to like him/her? For spending so much time with the civilians in an otherwise fast-paced scene, we leave them behind a little abruptly. Does the narrator’s mindset have to change at all from seeing if the civilians are alright to possibly shocking more civilians with a grenade? Again, I really enjoyed your story snippet. I think you have some great action along with some good word choices. The sentence structure is well-varied, too. Thanks for sharing your hard work. Best of luck with your endeavors! Thank you! The reader gets to see more civilians soon.